Designed by LEMAYMICHAUD The Quebec department store institution La Maison Simons is betting big on its first store outside of the province – in the West Edmonton Mall – sparing little expense as it begins its Canadian expansion and takes on a wave of foreign retailers. 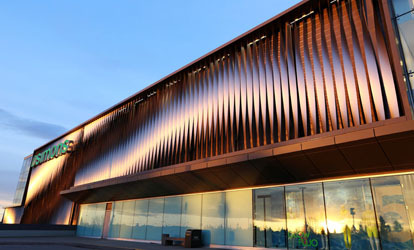 Architectural Titanium provided the matial for the facade which is composed of strips, some measuring 12 meters in length. The tianium strips are arranged verticaly and are turned and held in place at varied degrees of rotation. The visual effect produced is a dance of light and shadow that recalls the natural phenomenon know as the aurora borealis. The sublte reflectivity of the tianium produces a variety of spectral colors as the lighting conditions change.